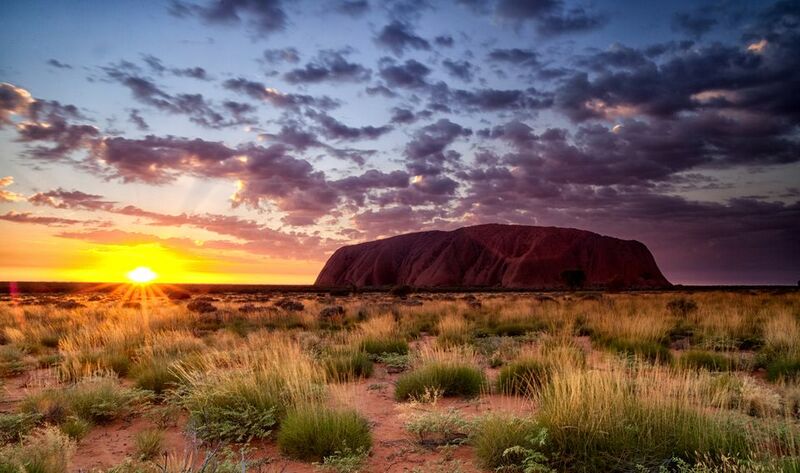 Australia has a worldwide reputation for its rugged outback. Between the east and west coasts, there are thousands of kilometers of rural landscapes to explore – including everything from tropical rainforests and cascading waterfalls, to huge expanses of red desert that stretch on for hours at a time. If you’re keen to tick some sensational sights and experiences off your bucket list by seeing Australia’s ​unique and diverse landscapes for yourself, consider adding one of these outback destinations to your itinerary! Plonked in the middle of Queensland, Longreach is a fair distance from any other town, but that is not what inspired its unusual name. It was actually called Longreach as a reference to the length of the Thomson River it sits beside. Longreach was put on the map by one of Australia’s most famous bushrangers, Captain Starlight, who stole a thousand cattle in 1870 and took them to South Australia. Now, tourists come to visit the Stockman’s Hall of Fame, the QANTAS Founders Outback Museum, or to take in the expansive views with a river tour. A few days can be well spent enjoying the food, meandering around museums and taking in all the charms of this outback town. An isolated old mining town, Broken Hill offers beautiful landscapes and taste of classic outback hospitality. It’s little wonder then that Broken Hill was recognized for its historical significance to Australia in 2015 when it was included on the National Heritage List. Here, you can wander through some 14 museums including the Bruce Langford Visitors Centre at the Royal Flying Doctor Service, and the Pro Hart Gallery. Living Desert Reserve is a must-see attraction, with sculptures framing the skyline. There is also the fauna and flora sanctuary where you can see unique Australian wildlife and get an insight into Aboriginal culture. At the Flinders Ranges, you can experience the color and character of outback Australia from the comfort of modern, luxury villas. There is an extensive list of activities and adventures to jump into in the Flinders Ranges, including mountain biking, delving into Aboriginal culture, soaking in thermal springs, four-wheel driving, or taking scenic flights over ​the breathtaking scenery. Do you fancy admiring a view that has been 80 million years in the making? This historic opal-mining town should be on every quirky traveler’s hit list, as it’s an outback destination with one very unusual twist: the lion’s share of the town is actually situated underground. The name ‘Coober Pedy’ is an anglicized version of the Aboriginal ‘kupa pitithe which means ‘white man in a hole’. This desert landscape has been supplying the world with opals since 1915 and now, despite a dry and dusty landscape, it offers tourists a number of memorable experiences. The Kimberley is one of Australia’s most enthralling destinations, with spectacular waterways, huge gorges, rock pools, ancient rock formations, and beaches. The sheer volume of highlights not to be missed is almost dizzying in this expansive, remote region. Watch the sunset on the back of a camel in Broome, drive along the Gibb River road, cruise along Lake Argyle, explore the beehive structures of the Bungle Bungles range in Purnululu National Park and camp, snorkel and visit local communities in the Dampier Peninsula. There are also 130-million-year-old dinosaur footprints to be seen at Gantheaume and if you come at the right time, you have the chance to see the ‘Staircase to the Moon’, an illusion created by the full moon on the water of Roebuck Bay. This massive World Heritage site of almost 20,000 square kilometers offers great ecological and biological diversity, from estuaries in the north to billabongs and arid landscapes. The land of Kakadu National Park is traditionally owned by the Bininji Mungguy, who have lived and cared for the region for about 50,000 years. Here, you can learn about ancient rock art dating back 20,000 years, take a scenic flight to get a view on this huge, remote site and be refreshed by natural waterfalls and swimming holes. This luxury train expedition begins in Darwin and in four days and three nights takes you through the red heart of Australia and to Adelaide. This is one of the most luxurious ways you can experience the outback and it’s also one of the most comprehensive, as the tour includes a number of off-train excursions, including a trip to the Nitmiluk (Katherine) Gorge, a cruise on the Katherine River, and a tour of Alice Springs, Coober Pedy, and Adelaide. There’s also the option to try and absorb the vastness of the Australian outback with scenic flights taking you over iconic landscapes including Kakadu and Uluru. No trip to Australia is really complete without a visit to Uluru, the monolith sitting near the center of Australia. It has been the feature of thousands of postcards and travel brochures and for good reason, as you’ll discover during your visit! You can explore the Uluru-Kata Tjuta National Park by helicopter, get up close on foot or ride a camel around the monument. There’s also the opportunity to learn about the natural wildlife and about the culture of the Anangu people, the traditional custodians of Uluru that have lived in the area for about 22,000 years. From Ayers Rock Resort, you can take a luxury wilderness camp and fall asleep under an uncountable number of stars – a beautiful way to end a day of discovering the heart of the Australian outback.